Happy Mother’s Day! Not only is the following dessert a favorite of my mother, the timing is ideal, as rhubarb’s short season is upon us. 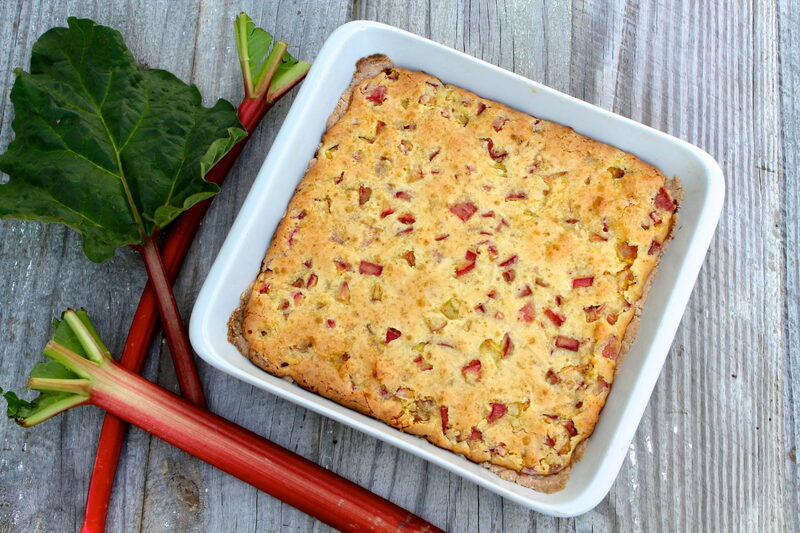 If you haven’t baked with rhubarb before, this recipe is a very good starting point. 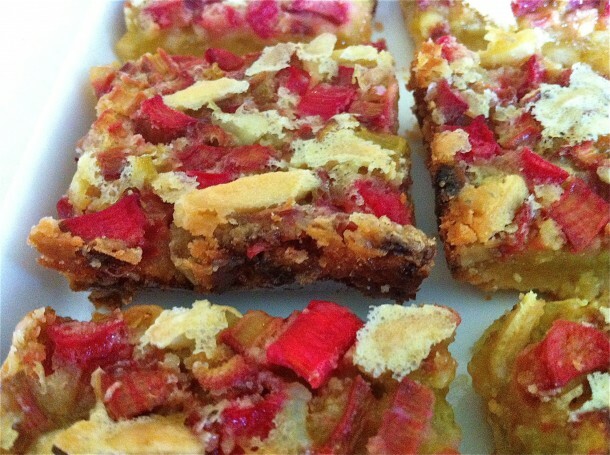 I am not sure how many people would offer up rhubarb bars when asked their favorite dessert, perhaps favoring something including the words chocolate or ice cream! The first time I made these, my husband, who did not grow up eating rhubarb, only ate one because he thought he should, kindly acknowledging my effort. I remember well the look on his face as he took his first bite. He sort of went slack-jawed and managed a simple, “These are amazing.” My kids love them, too. Over time, I have made tweaks to the recipe, adding ground ginger to enhance the flavor and slivered almonds for crunch. For the crust, I often use coconut oil instead of butter, which creates a crisp, delicious base that is a perfect contrast to the slightly gooey top. You may use butter, if you prefer. To boost the coconut flavor, I usually add some shredded coconut. But never fear, if you are not a coconut fan, this may be omitted. I have made this recipe, including the crust, with my all-purpose gluten-free flour blend and it works beautifully. The flour mix ingredients may be printed via the link below. Cream together all crust ingredients. The dough will be fairly stiff. Press dough into a 7×11 or 9×9 pan (I use a glass Pyrex pan). Bake at 350 degrees F for 13-15 minutes, or until just cooked. While the crust is baking, prepare the filling: Beat eggs, and then add the sugar, optional shredded coconut, flour, ginger, and salt. Gently stir in the rhubarb and almonds. Spoon the filling carefully over the hot crust. Bake for 30- 35 minutes more. Cool completely before cutting into bars. I store leftovers, covered, in the refrigerator. Note: For my All Purpose Gluten Free Four Blend recipe, click HERE, or use your favorite cup-for-cup replacement. I LOVE this recipe- all the different flavors sound so good together! I also am just getting into using coconut oil more seriously and look forward to trying this with some of my rhubarb and coconut oil! Thanks for sharing. I have really gotten into using coconut oil, too, and I was so pleasantly surprised by how crisp and yummy it made this simple crust. It reminded me of shortbread. Thanks for the thoughtful comment! I am using coconut oil more and more, Debi. I think you will like it! These look amazing, cant wait to try this. As for the coconut oil it makes a huge diffrence if you buy the extra virgin coconut oil. If it is not it has no flavor and is more like using crisco. Extra virgin is hand pressed and is so much better for you. I have to order from the internet or go to larger citys that have organic markets to get mine but its worth it. Thanks for the comment and the great tip, Coni! I always buy the extra virgin coconut oil myself so I appreciate the feedback regarding the alternative. I use this oil more and more and keep finding great new uses for it. I hope you enjoy them, Marlys! Butter may be substituted, by I do think the coconut oil adds a little something special. I didn’t even get to the filling yet. I just made the crust. Pulled this one up as I got coconut oil cheap at Marshalls recently. OMG the crust is good. Might not even need the filling,,,,might just eat the crust like a coconut cookie. ok the filling DID make it onto the bars. I know it says that the coconut is optional…but I think that is what makes these extra good/something different. I don’t think the coconut is optional! I am glad you made it to the final step! I list coconut as an option as I know there are some who are not a fan, and I initially created this recipe without it. As for me, I do prefer it, too! the coconut crust still ended up being my favorite part of these….so I just made another batch of crust only, added a 1/2 cup of coconut and made cookies out of it.Baked at 350 for 15 min. Coconut shortbread, Yum! Just made these today, and everyone loved them! The coconut and ginger was a nice change-up. I do want to share a couple of tips that I learned in the process. Because my coconut oil is in the cupboard in California, it was melted, and that turned the “dough” into a batter. I was really worried about it and tried to add more flour, but it didn’t do anything. The batter actually spread better and was easier to deal with, but it was unexpected given the directions. Just know that batter is OK. If you have a gluten free flour mix that you already use, you’ll need to add in salt and xanthan gum separately to the recipe. My flour mix is just brown rice flour, potato starch and tapioca flour. Once I added that in, I put in 1/4 teaspoon xanthan gum and 1/8 teaspoon salt. We like our rhubarb much tarter, so I did 2 cups of rhubarb to 1/2 a cup of sugar. That was a perfect ratio for us. Hope that helps someone else. Thank you for the great feedback, Tanya. I’m thrilled you enjoyed these and that you took the time to share your tweaks. The gluten-free blend that I linked does have xanthan gum, but your point is a good one…as is the feedback on the melted oil. Thanks again! One last thing – I didn’t have slivered almonds, so I coarsely ground up about a 1/4 cup of almonds in the food processor. It worked great! Such wonderful feedback. Thank you for letting me know!